Brake lights, tail lights, turn signals, horns, headlights, radios, GPS and similar accessories on your golf cart use 12-volts. But, most golf carts have either four 12-volt batteries, six 8-volt batteries or eight 6-volt batteries which are considered 48 volt system golf carts. (4X12v=48v) (6X8v=48v) or (8X6v=48v). Some golf cart’s use a 36-volt system consisting of six 6- volt batteries. 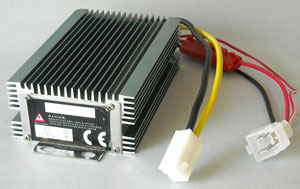 (6X6v=36v). To power the cart accessories, 48-volt carts with six 8-volt batteries use a 16-volt-to-12-volt Voltage Reducer connected to two 8-volt batteries. The total 16-volt power is thereby reduced down to the required 12-volts. Similarly, golf carts with four 12-volt batteries typically are wired with just one of the four 12-volt batteries powering all the accessories. The main problem with these wiring patterns occurs because these golf carts use just one or two of the cart’s many batteries to power all 12-volt accessories leaving the other batteries in the battery bank in a higher state of charge. Now, to further complicate the situation, when you plug-in your cart charger, it does not completely charge the accessory batteries to the same level of the others in the cart battery bank. So over a short period of time the accessory batteries continue to drop lower and lower in voltage, even to the point of possible dimming of lights and loss of power and distance. In addition, when battery voltage drops over time, sulfation begins which causes battery damage; less distance per charge; and less performance to the accessory batteries. If this problem is not rectified, accessory batteries can be permanently damaged and never will be able to provide the same performance as when they were new. If you are experiencing loss of distance; lack of speed; abnormal or erratic acceleration; and even possible dimming of your headlights, how your cart accessories are wired to the batteries could very likely be the problem. A 36-volt or 48-volt-to-12-volt Voltage Reducer will help rectify these problems. A 36-volt or 48-volt-to-12-volt Voltage Reducer (see photo) solves these problems as it’s wiring is connected to draw accessory power equally from all the batteries in the battery bank. Then upon recharging, all the batteries are charged equally. In other words, all the batteries go down in voltage together, and then they all get charged up together equally. Thus, longer battery life, longer distances per charge, better golf cart performance and less damage to batteries is achieved. We use only a 30 amp 36-volt or 48-volt high technology Voltage Reducer allowing all cart accessories to operate from all cart batteries. These Voltage Reducers are sealed against dust and moisture and they integrate heavy-duty heat sink radiator fins for better cooling. Total time for installation is approximately 1.5 hours at your residence.